This is the second part of my post from last Tuesday. I love a good and cheap beauty find and the drugstore is the perfect place to go for that. Like I said last week this was just supposed to be one post, but I have too many drugstore beauty loves that I wanted to share so I had to break it into two! This week I'm sharing ten more favorites that you are sure to love too. I have a little bit of a sweating problem and this is literally the only deodorant that works for me. I've been using it for years and really love the results. I've also tried the clear gel and invisible solid versions, but found that the clear gel didn't work as well and I had a really bad allergic reaction to the invisible solid version so I stick with the smooth solid. I started using this this winter and honestly do not know how I didn't try it earlier! It is a do all ointment that can be used on any part of your body that gets dry. The area around my nose gets crazy dry in the winter from constantly blowing my nose and this is the only thing that has helped it to completely heal! This lip liner is great because it is universal and can be used with any color lipstick. I've found that it really helps to keep lipstick in place and prevent it from bleeding. It's also super moisturizing, which is especially helpful in the winter. Since I've started using this I never put on lipstick without it! This is great for moisturizing and fading scars. I started using this a few years ago when I had surgery to help with the scars left behind and actually landed up using it to moisturize the area where I had the surgery because all the taping just destroyed my skin. This landed up saving my skin and really helped it to heal. I now put it on surgery scars and anywhere that needs a little extra moisture - including my face (it doesn't clog my pores!). This is good for healing burns and sunburns, and moisturizing the skin. I prefer this brand because it is 100% aloe and doesn't contain other ingredients, which can be hard to find. I use this to moisturize my back and chest because it is the only thing that doesn't clog my pores. Additionally aloe helps to heal acne and my chest is prone to breakouts so I often use it to help with that too. I hate the way traditional baby powder smells so I always go with this Lavender/Chamomile option because it smells much better! I use baby powder as a dry shampoo (I alternate it with Batiste Dry Shampoo) because it does a really, really great job at soaking up oil. Baby powder is also good to have on hand for really hot and sweaty days to help keep you dry! I've talked about this on here quite a few times before because it is so wonderful. I love a lot of Aveeno's products, but this is definitely my favorite. It does a great job of moisturizing skin, has SPF 30 sun protection, and smells amazing. This lipstick has a cult following and there is no wonder why - it's a gorgeous color that is flattering on a variety of different skin tones. It's also super inexpensive, which is always a big bonus. 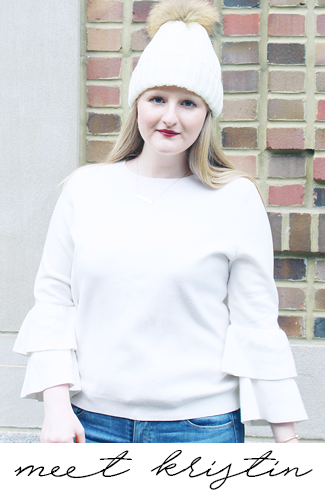 It's the perfect dark winter lipstick, but I also love wearing it in the summer for an unexpected beauty look. I've only ever used Venus razors since they are truly the best. The original Venus was my first razor and while I've tried a few of their other razors it still remains my favorite. It gives you a really close shave and is super easy to use. Additionally, I think that it helps to prevent nicks and razor burn. Witch Hazel is another product that I've mentioned on here quite a few times before. It's great for a variety of different things and is something I think that everyone needs in their beauty arsenal. My favorite way to use it is as an astringent, especially along my hairline to prevent breakouts. 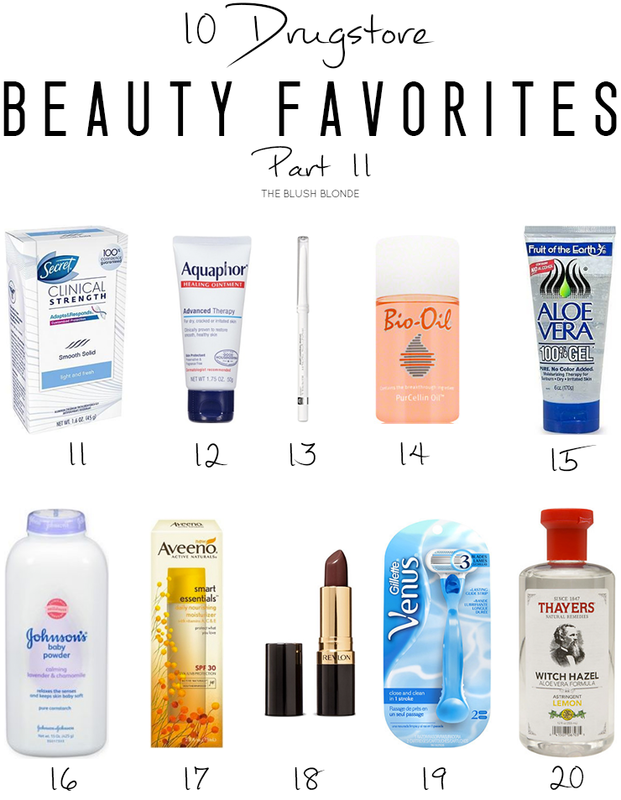 What are some of your drugstore must haves? Aveeno and Aquaphor are two must haves in my house! Such great products! I would love for you to join my weekly link up On the Edge of the Week! It goes live every Thursday at 5:00 p.m. EST and remains open for a week. I hope to see you there. Have a wonderful day! I love the clinical strength deodorant! I've also used Old Spice (the least "manly" smelling one) too because it has stronger protection, especially when I'm going to work out or something! I use to buy witch hazel and I don't know why I stopped! Thanks for reminding me about such a great product! Aveno is my jam!! Their lotions always moisturize like crazy. I use those razors too! I need to try that witch hazel as well. Thanks for sharing! I've heard so many good things about witch hazel and had no idea there was a lavender chamomile baby powder. I also hate the smell of regular baby powder so the lavender chamomile is a good option! I've used that deodorant before and really liked it! I really should pull out my witch hazel more and use it where I tend to get breakouts- it might help! I love that aloe vera gel! It's great for using in your hair because it won't dry it out and actually moisturizes it! This reminds me that I need to get more of the clinical strength deodorant. I would really like to try the aveeno moisturizer. I only ever use Venus razors too - they really are the best! I've never heard of Bio-Oil before, but I'm really interested in it now, as I have some acne and other scars on my face that I'm trying to fade. I love that lipstick! I've been looking for a similar color for a while, I might have to pick it up! That liner is amazing, I love it too!